Everyone is creative and the Studios of Cocoa Beach, 165 Minuteman Causeway in downtown Cocoa Beach offers Sip n’ Paint Parties for adults. Artist and experienced teacher Delia Swenson will guide you through a complete painting from 7 to 8:30 pm on Saturday June 9, 2018. Bring your friends and your favorite beverage and go home with a complete work of art. 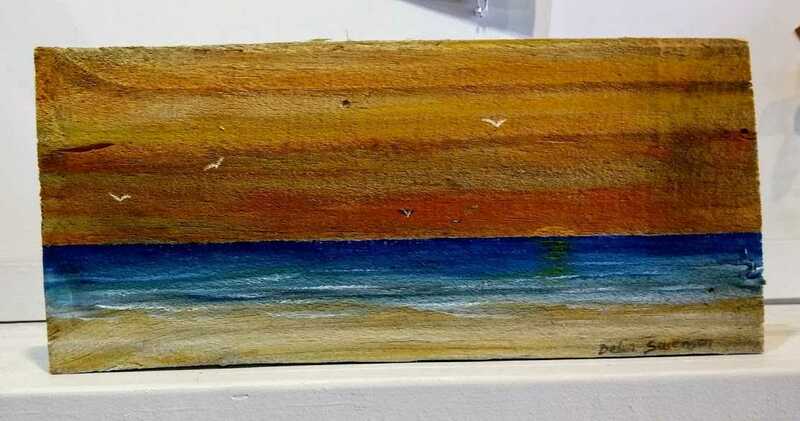 You will be painting a Cocoa Beach Sunset on a wooden fence plank. The Studios of Cocoa Beach is a non-profit art gallery and the creative hub of downtown Cocoa Beach with a full schedule of workshops in a variety of techniques from beginner to advanced, adults and children. The Studio is open Monday and Tuesday 10:30 am to 3:30 pm, Wednesday through Saturday 10:30 am-8pm and Sunday 11 am-4 pm. For more information on exhibits, Studio artists, or the complete workshop schedule, visit the website: www.studiosofcocoabeach.org or call 321-613-3480.